A fun word has been creeping into the modern vocabulary recently. The term “man cave” is being thrown around all over the place, and rightfully so. I mean, if you’ve got the extra room who wouldn’t want a man cave? Wait, you don’t know what a man cave is? Ok, well basically, a man cave is a space that a guy makes his and his alone for solitary relaxation or to spend time with his buddies. Typically man caves feature big couches, pool tables, bars, dart boards, big screen TVs, and more guy things, but really it depends on the man. 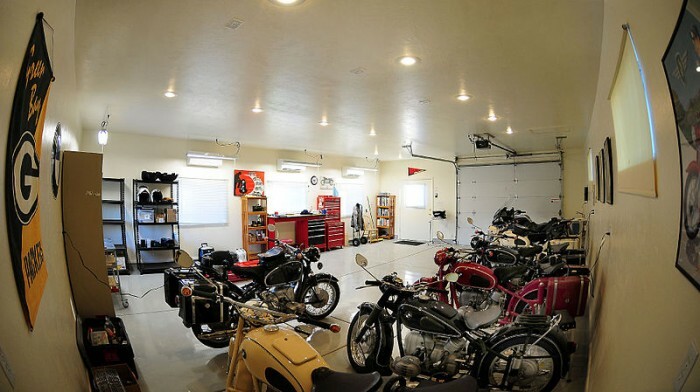 For some guys, a work-out room is their man-cave or a little woodshop or (as seen above) a garage filled with motorcycles. Just think of it as a no-girls-allowed type of club for adults. You know what we bet would look great in any man-cave? A Contempo Wall Modern Entertainment Center Wall Unit. Display the big screen TV in style, and with custom storage options ranging as far as the eye can see, we might even be able to make a place to stash a few beers. What’s in your man cave? This entry was posted in entertainment, furniture and tagged Chicago Tribune, entertainment, man cave, no-girls-allowed, solitude. Bookmark the permalink.